Another rainy morning has put me (once again) on the treadmill. I was fine with that. In fact I almost prefer the treadmill when I have limited time and want to have an easy workout. Running slowly outdoors means that I need to take more time to complete the loop back to my house. That results in less recovery and transition time before I start my workday. Advantage treadmill. I'm due to post my reviews of the new Saucony Kinvara 3 and the Spira Stinger XLT running shoes on Runner's Tech Review shortly. I'd spent a few weeks running primarily in the Spiras while I waited for the Kinvaras to arrive, and then switched to running mostly in the Saucony's over the past few weeks. In between, I ran in the Saucony Hattori's for a 5K and for some treadmill workouts. This morning I went back to the Spiras so they'd be fresh on my mind when I start my writeup this weekend. Although I do focus on running shows more than the average mid-pack runner, I no longer think that a shoe will make a measurable difference in my performance. More specifically, I don't think two shoes within the same genre (race, trail, etc.) will provide significant differences. 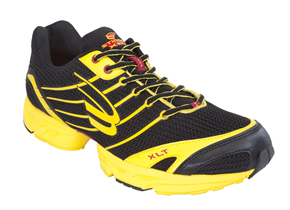 It comes down to whether a shoe feels right, moves well and enables my best performance. The Spiras continue to impress and it's interesting to see how they'll compare to a Tier 1 player like the Kinvara 3.